Stellar Outdoor merged with Annis-way Signs and Specific Hi-way Signs on January 1, 2012. In the past couple of years, we also amalgamated with Vision Outdoor Advertising and GKP Billboards. By doing that, we are excited to have a combined inventory of 500+ traditional billboard sites; effectively offering our clients many new regions and product offerings to suit their needs. Our oldest company, Annis-Way Signs, was established in 1947 by Lloyd Annis. Lloyd was an artist and sign writer who lovingly hand-painted signs and billboards for many decades. For over 70 years, we have helped our clients grow their businesses by creating billboards that are effective and produce results. 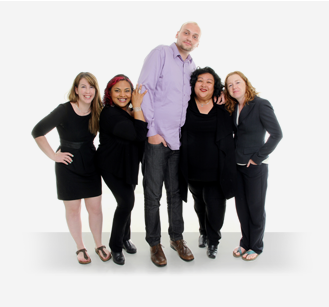 Our team will assist you to determine the optimal campaign for your needs. We will help you choose the correct locations, create the ad message, and provide performance measurment tools to track the successs of your campaign. is the President of Stellar Outdoor and Vision Outdoor Advertising, as well as Beautiful World Canada. She was the former President of Annis-way Signs and Specific Hi-way Signs. She has been in the billboard and signage industry for over 15 years with a focus on developing billboard sites and helping clients grow their businesses. Sara holds a MBA from York University and Bachelor Business Administration from Wilfrid Laurier University. helps our customers create memorable ads and does what is needed to ensure they are installed on time all over Ontario and Saskatchewan. She works to ensure your creative content and messages are readable to motorists as they pass your billboard at speeds up to 120 km/hour. Michelle has been head of our Operations and Accounting for over 8 years. She managed the amalgamation of 3 outdoor sign companies and the acquisition of our 2 newest companies. She handles our day-to-day business as well as our ongoing business development opportunities. helps existing and potential customers choose the right billboards that are best suited for their needs. Kristine analyzes, identifies and promotes the most effective outdoor locations for your business. Kristine heads up our sales department at Stellar and Vision and has over 25 years of sales and customer relations experience. Through her perseverance, Kristine goes above and beyond to help bring further awareness to your brand. She has also won numerous awards for her achievements in outstanding sales and customer service. oversees new builds and construction, aiming to place your advertisements in prime locations. He works closely with landowners to negotiate ideal billboard placement and surveys the best placement options that can increase your brands awareness. As the one of the newest members of Stellar and Vision's team, Eldar has been using his multiple years of experience in customer service to negotiate with builders and landowners alike. is the newest addition to our Stellar team and brings over ten years of administrative experience with her. In addition to handling our social media and other communications, she oversees our vendor work orders to ensure installs and repairs are done timely and efficiently. Emerald prides herself on her attention to detail and enjoys taking on new projects and responsibilities. 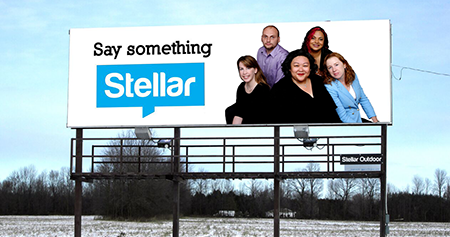 In her new role at Stellar, she looks forward to working with the team to accomplish a variety of ongoing initiatives that will improve your customer experience and expand your advertising reach. We are a company that believes that we have a responsibility to contribute to the world and work to make it a better place. 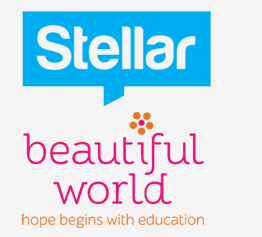 We have decided that a portion of our profits will be put to a greater use in assisting the Canadian charity, Beautiful World Canada Foundation. Copyright © Stellar Outdoor Advertising 2019. All Rights Reserved.